If you were completely disgusted by that top layer of solidified milk on a rice pudding or similar dessert then stop reading here, this post is not for you. 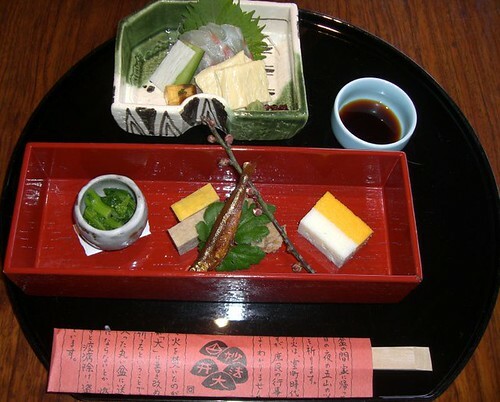 This particular delicacy seems to split eaters just about as evenly as marmite or, in Japan, Natto. I happen to be in the latter category and so it was with great delight that I was taken for a meal of yuba (link is to the restaurant we dined at - see yuba kaiseki cuisine). This meal was a strange combination for me, taking place in an extremely elegant restaurant with a selection of 10 or so dishes of the best fish, the freshest vegetables and some of the finest tempura I've ever eaten, combined with a childhood love of that top layer of solidified milk. Yuba is a double-boiled soy bean milk, though it tastes much like full-fat cows milk. 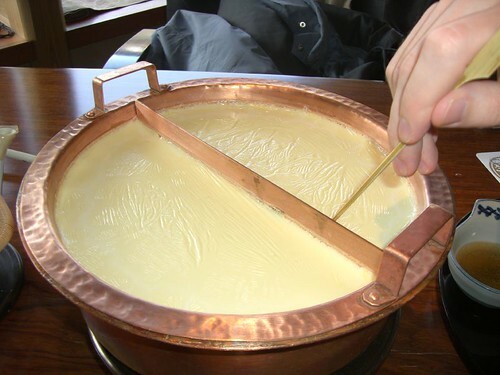 The top layer solidifies in the copper bain-marie in which it's slowly heated. Once solidified you use a wooden implement to separate the thin film from the sides and then pick it off the top of the liquid. You then dip it in a very fine savoury sauce, and eat. Then wait for a few minutes for the top layer to solidify again and repeat, again and again and again. For anyone who covetted this particular foodstuff as a kid this will be a dream come true. All the rice-pudding tops you could ever want, without getting full from the slightly inferior food underneath. After a couple of hours of extremely fine dining we headed back to the office, our preternatural urges satisfied. Incidentally, for any scientists who enjoy cooking, or cooks who want to know why food does what it does, then I highly recommend McGee on Food and Cooking: An Encyclopedia of Kitchen Science, History and Culture. This is an incredibly detailed encyclopedia detailing just about every ingredient and process that goes into making the bread rise, the meat tenderise, the eggs fluff up and the pineapple preventing the jelly from setting (the enzyme in pineapple which catalyses the breaks down of gelatin is the same enzyme which makes it a great tenderizer of meat. It's also why some people, myself included, are allergic to pineapple, with fairly unpleasant oral reactions). Every topic is treated in great detail giving feasts of information about the chemicals, enzymes and molecular processes which go on in the kitchen. It's a true joy for anyone who has a love of food and science. Today, having feasted on fine foods yesterday, satisfying my childhood urges, I enjoyed a rather more adult culinary treat. In the South-East of Kyoto, a short train ride from the centre in the ever-misty foothills of the surrounding mountains sits the Yamazaki Suntory Whisky distillery. 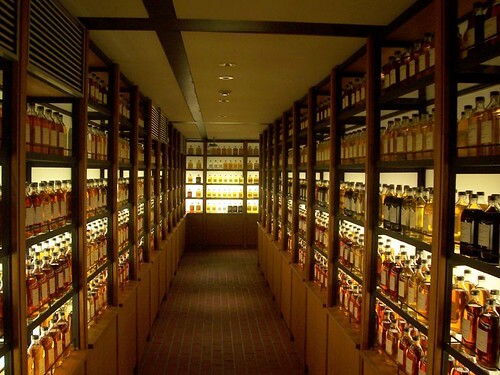 Since the 1920s this distillery has been producing some world class whiskies. My last distillery experience was marred slightly by arriving there early by almost two decades. Now, with a few fine whiskies under my gastronomic belt I could appreciate a good deal more some of the subtlety of the process than I had at the age of 11. Though the tour itself was in Japanese, the tasting session is omni-lingual and although we were forced to taste the samples with ice and water (the Japanese I'm informed are not used to drinking it straight) the 12 year old whiskys were pretty good (I'm no connoisseur but I found the added mix of ice and water meant I couldn't really appreciate the depths of flavour). After the two free glasses however, you're free to sample from the tasting menu, for a price, and then the dram comes as you like it. I splashed out on a glass of a 1980 distillation and it was truly one of the finest whiskies I've tried. 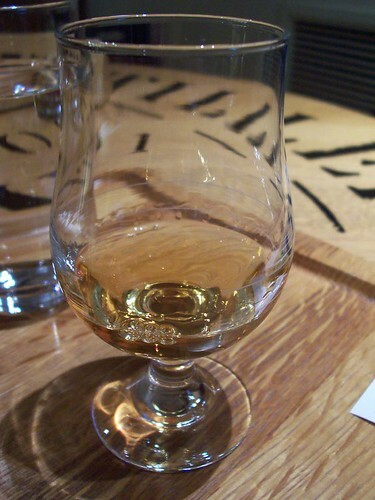 If you enjoy whisky and are in Kyoto I would highly advise taking the short trip out. You'll also be able to pick up some excellent, bottles straight from the factory at much cheaper prices than you could elsewhere.